It is that time of year for getting together with friends and having a great backyard BBQ. The season calls for it on its own, but there are a few more reason coming up that will make you want to host your own BBQ. Father’s Day is upon us and we all know Dads love to grill up some meat and enjoy time with friends and family. Hop ahead a few weeks and we will all be celebrating the Fourth of July. Both of these occasions are the perfect time to host an outdoor party and celebrate with friends and family. Today we are sharing a few of our tips to make sure your BBQ is one of the best and you still have time to enjoy it yourself. First you will want to get your outdoor space ready and prepped for guests. Maintain the lawn, set up seating areas, spruce it up. If you are looking for great tips to get your space ready for a party then check out our tips to Make Your Space Summer Ready. 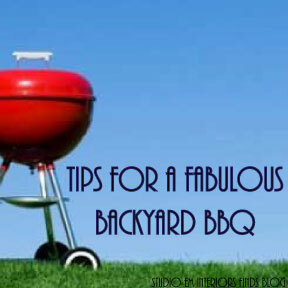 Once you follow those tips your space will be ready for a party at a moment’s notice, meaning you won’t have as much prep to do for your BBQ. Decide who you want to celebrate with and invite your guests. Plan for a few more in case they bring a friend as well, a BBQ is always fun with more people. Decide on a menu, will you be providing all the food or do you want your guests to help out with side dishes and dessert and do your BBQ potluck style. Be sure to let guest know when you invite them so everyone knows what is expected. Be prepared and prep as much as you can prior to the event. Chop vegetables ahead of time, marinate meats, and get your space set up and ready. Keep things simple. Set up a drink station so guests can serve themselves (tips for this here). Set up a table for the food and plates close to the grill so guests can serve themselves will all the sides and then load up at the grill before heading off to eat. Looking for some fun ways to serve at your BBQ? Have a gourmet burger bar like the one we found here on the Card Store Blog. 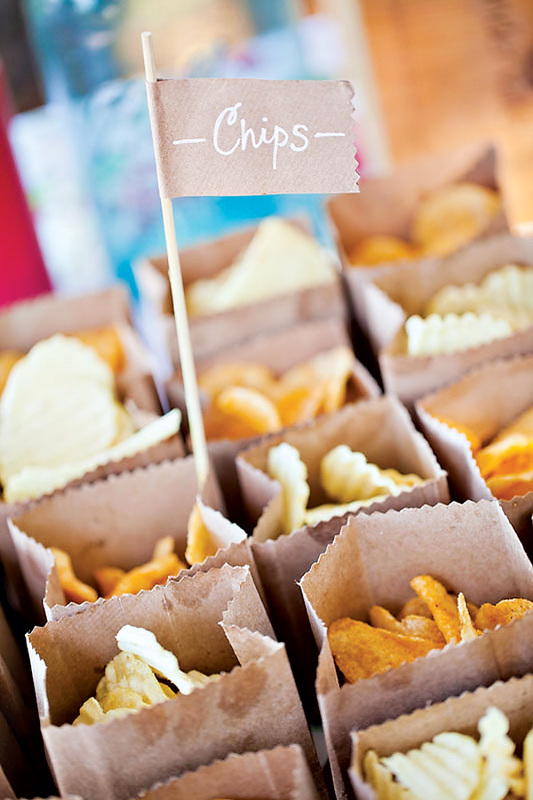 Set out paper bags filled with chips and containers with vegetable and dips like they did on the Hostess with the Mostess Blog. This will make it easy for guests to grab food and go mingle. Set out plates and silverware so guest can easily grab and go as well. 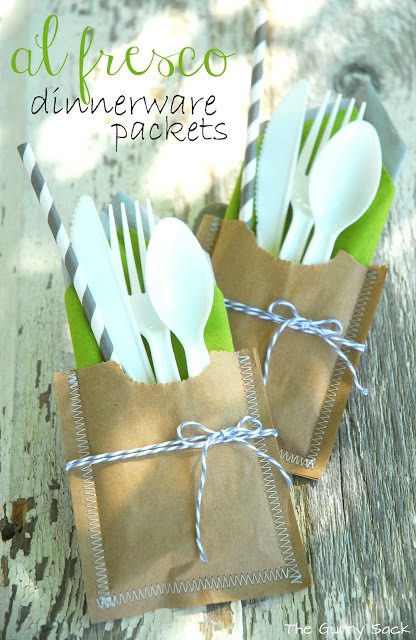 We love these Al Fresco Dinnerware Picnic Packets from The Gunny Sack. Of course you don’t want to forget dessert. Make this easy as well and serve desserts in mason jars (another great grab and go option). We love this S’mores Dessert Trifle in a Jar from Mom Endeavors, but you can find lots of options by searching on Pinterest if you want something else. Lastly, you will want games. Set out some lawn games like corn hole, horseshoes, or even crochet. You can even set out water balloons and water guns for the kids (or adults) to have a water war. Always a fun option if the day gets a bit warm. Now start planning and throw you best backyard BBQ yet!